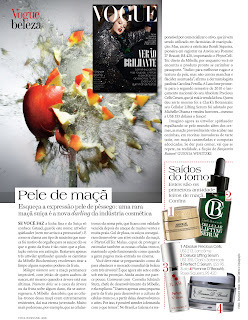 3LAB's Guide to Luxury Living: Apple Stem Cell Technology...Vogue Brazil is Buzzing!!! Apple Stem Cell Technology...Vogue Brazil is Buzzing!!! Thanks so much to the editors at Vogue Brazil for acknowleging 3LAB Perfect "C" Serum in their December 2009 issue! The article, on the marvels of apple stem cell technology in skincare, looks at the newest technology and their favorite products that contain it. Thanks so much!